No American of European descent who sets foot on the sacred soil of Europe can help but feel a powerful connection back to his European heritage, no matter how far in the past it might be, nor can any such person who is not deluded escape the feeling of urgency that grips those who experience first-hand the death spiral in which this continent is currently locked. Such have been my feelings over the past several weeks, after I arrived for the first time on the European continent, specifically in Sweden. 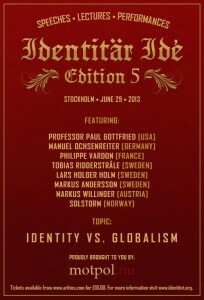 The purpose of my trip here was to assist with Identitarian Ideas V, the fifth in a series of conferences in Stockholm sponsored by the Swedish identitarian organization, Motpol, which shares personnel with Arktos, the publishing venture of which I am a part. Although I do not have a drop of Scandinavian blood in my veins (my background consists of various Germanic and British ethnicities), I cannot help but be impressed by what I have witnessed since coming here. Despite decades of radical liberalism, the Swedish people remain a proud, beautiful people, and when walking down the street in a Swedish city it is as if one is walking among Nordic gods and goddesses. The Swedes still have a sense of their own identity, even if time is drawing short for a real reawakening, if present trends continue: out of a total population of 9 million, 2 million are already immigrants, with more arriving by the boatload ever year, eager to benefit from the Swedes’ generous social programs. As a European-American, I share the same feeling being in Sweden that Philippe Vardon spoke about at the conference – namely, that I feel at home anywhere on the continent of Europe, as it is my ancestral homeland, and is therefore a part of my own identity that can never be lost. 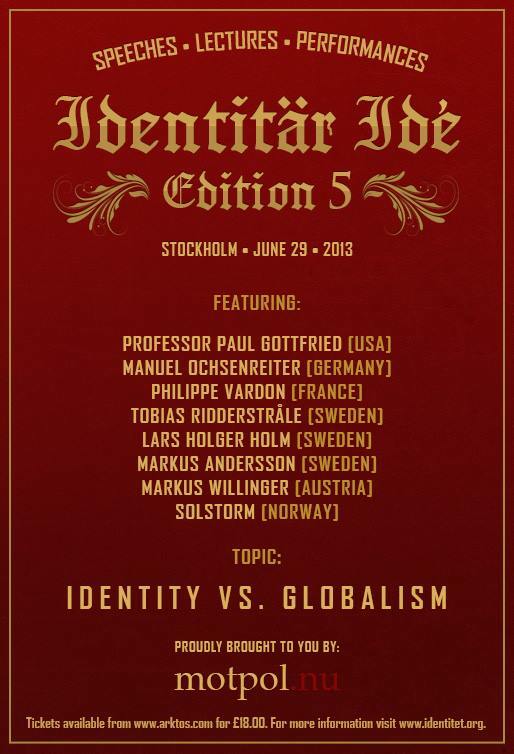 The theme of Identitarian Ideas V was “Identity vs. Globalization,” and the venue, as several of our Swedish hosts pointed out to me with a smile, was a place typically used by Swedish artists of a Leftist persuasion. It thus gave them great pleasure for us to occupy the space, even for a brief time. The event took place on Saturday, June 29. The program began with Professor Paul Gottfried of Elizabethtown College, doubtless the most prominent paleoconservative intellectual in America today, who spoke on “‘Cultural Marxism’ and the Frankfurt School.” Prof. Gottfried began by contrasting the various branches of Marxism that have emerged over the last century. He pointed out that Communism as it was realized in the Soviet Union and by those governments which followed in its Marxist-Leninist footsteps tended to be quite socially conservative, by today’s standards, and that orthodox Leninists would no doubt have treated cultural Marxists in their own societies as dangerous subversives. Ironically, cultural Marxism can only thrive in a bourgeois-democratic society of the very type that Marx sought to overthrow. The bridge from Marx to cultural Marxism was the Frankfurt School of Weimar Germany, which later migrated to the United States to escape the clutches of the National Socialists. The Frankfurt School promoted a form of Marxism very different from Bolshevism, and which was intended to take root specifically in the nations of Western Europe and North America. Prof. Gottfried pointed out that all of the major thinkers of the Frankfurt School were Jews, and indicated his belief that their efforts to attack the very foundations of Western civilization – the family, sexuality and gender roles, hierarchy, and so forth – was at least partially due to their conviction that Western bourgeois civilization is inherently anti-Semitic and must be destroyed in order to make the world safe for Jewry. Interestingly, however, Prof. Gottfried believes that the founders of the School eventually came to regret the outcomes of their own efforts. He briefly recounted his experiences in studying with one of the Frankfurt School’s luminaries, Herbert Marcuse, while a graduate student at Yale in 1964. He recounted an anecdote in which Marcuse was derisively dismissive of a feminist rally that occurred on campus; those who laid the groundwork for cultural Marxism, he maintains, were repelled by the very social trends that they helped to initiate. But Prof. Gottfried’s view of the Frankfurt School was not entirely negative, and he claimed that the critical tools that they helped to fashion can be just as useful in the hands of the Right as of the Left; he pointed out that some of his own critics have referred to him as a Right-wing exponent of their doctrines. The next speaker was the Swedish lawyer and Arktos staff member Tobias Ridderstråle, who spoke on “The Facts in the Julian Assange Case.” Julian Assange is the founder of WikiLeaks, the organization which has caused great embarrassment to the American government in recent years with its release of large amounts of classified U.S. documents. Assange has been taking asylum in the Ecuadorian embassy in London for more than a year now to escape extradition to Sweden to face two accusations of sexual misconduct by Swedish women. Mr. Ridderstråle, with great humor, detailed the flimsiness of the evidence that has been brought against Assange and the strangeness of the charges that have been made in the Swedish courts, pointing out that there is most likely an ulterior motivation behind them. Although Mr. Ridderstråle did not specify what this motivation might be, it is clear that the American government is most likely the one pulling the strings behind these developments in an attempt to discredit and retaliate against him. While Assange did not come across as a saint in this talk, it was clear that there is more to his case than meets the eye. Following this was the 20-year-old Austrian student Markus Willinger, who is currently studying at the University of Stuttgart. Willinger is the author of the recent Arktos publication, Generation Identity: A Declaration of War Against the ’68ers. Willinger gave a rousing call to action, telling the audience that his generation has been victimized by the extreme liberal policies that were enacted by the earlier generation that had come of age during the student revolts of the late 1960s (their counterparts in America are known as the “baby boomers”). If these trends do not change soon, Willinger explained ominously, his may be the last truly European generation to inhabit this continent. He detailed how the policies of the ‘68ers were a reaction against the fear of another fratricidal war breaking out on another European continent, which was not a bad notion in itself, but the ‘68ers completely misdiagnosed the problem by believing that the blame for the world wars lay with Europe’s own traditional values and culture. In order to regenerate Europe, its youth must take to the streets in the same way that the ‘68ers did, only this time in defense of traditional Europe rather than in opposition to it. He also said that this time the revolutionaries must fight for the right of all peoples to their unique identity, and not only the European identity, since the problem of identity is a universal one today, when every part of the world is confronted with globalization. His talk was extremely well-received by the audience, which consisted largely of young people, and we can hope that many of them were stirred to action by his words. Next was another speaker on the theme of identity, Philippe Vardon, who is one of the leaders of the Bloc Identitaire of France, a youth movement which was one of the first identitarian groups. It stands for the right of the French to their traditional identity in the face of mass immigration and globalization – neither the USA or Allah, as Vardon said. Generation Identitaire gained international notoriety in November last year for their occupation of the mosque at Poiters, at the site where Charles Martel had turned back the Muslim invaders in 732. After showing some video of this, as well as his group’s storming of the headquarters of the Socialist Party in Paris last May, Vardon expressed appreciation at being able to address the conference at all, explaining that he had recently been turned back at the airport during an attempted trip to Canada by the police. The conference next moved to the geopolitical level with Manuel Ochsenreiter, who is the Editor-in-Chief of Zuerst!, a Right-wing news magazine in Germany which has a circulation of 70,000. Ochsenreiter has garnered attention in recent years for his coverage of the ongoing war in Syria, a country with which he has been intimately familiar through his many visits there, which began prior to the outbreak of the conflict. Ochsenreiter has been one of the few Western journalists to report from the Assad regime’s side. Using many of the photos that he has taken there to illustrate his points, Ochsenreiter pointed out the many falsehoods that have been reported by the Western media, such as when it was reported that fierce fighting was taking place in the streets of Aleppo: according to Ochsenreiter, who was there, life was going on as usual in the capital on that day, with only the sounds of fighting being audible from the outskirts of the city. He also recounted the story of a hospital he had visited which had been attacked by rebel artillery, but which other Western journalists had completely ignored in their reporting. The same has been true for many of the other atrocities committed by the rebel forces, such as the ongoing executions of Syrians and foreign journalists, not for the “crime” of supporting Assad (since many of those murdered do not support him), but rather for failing to support the rebels. For the Syrian people, Ochsenreiter explained, this war is not a civil war, but rather a war of the Syrian people against Islamist extremists, most of whom have come to Syria from elsewhere (many of the rebels do not speak Arabic, he said). Prior to the conflict, Ochsenreiter says, many of the Syrians were either ambivalent about or even negative towards Assad’s regime, but when faced with the brutality and extremism of the rebels, most have realized that they are much better off than they will be if the regime is toppled. Next on the agenda was yours truly, who spoke on “The Past, Present and Future of Arktos.” I described the birth of Arktos in 2010 out of our previous company, Integral Tradition Publishing, and how we ended up establishing our office in India in order to keep our overhead costs low. We have managed to publish nearly 60 unique books in four languages since that time, and have established ourselves as the home of the European New Right in English (although we are not limited to that, of course). I also described how our books have attracted attention from across the political spectrum, from the pages of The American Conservative (which reviewed Paul Gottfried’s War and Democracy in April) to the liberal countercultural magazine AdBusters, which ran excerpts from our edition of the Finnish radical ecologist Pentti Linkola’s book, Can Life Prevail?, in their May/June 2011 issue, simultaneous with their calls for what later became the Occupy Wall Street movement. This means that Arktos has been enjoying some success in attaining its goal of reaching readers outside of the usual crowd who would normally never pick up a “radical Right-wing” text, which has always been part of our intention in doing Arktos. I also described a few of our upcoming projects. The last speaker of the day was the Swedish author Lars Holger Holm, who was introduced as a “Renaissance man,” with his extensive knowledge across a wide range of subjects. Holm spoke about and read from his new book, Gotisk, co-authored with the Dane, Kenneth Maximilian Geneser, which was recently published in Swedish by Arktos. The book describes the ancient Gothic past of Scandinavia, in particular their leader chieftain Theodoric, and his words, which evoked the age of their ancestors, seemed to have a hypnotic effect on the largely Scandinavian audience. As the conference came to an end, the Norwegian neofolk group Solstrom gave a live performance, providing the perfect musical accompaniment to our verbal efforts to define the essence of the European identity. After the end of the conference proper came my favorite part of any such event, which was the opportunity to meet and speak with the members of the audience, many of whom number among Arktos’ clientele and with whom I usually only have contact through the Internet. I am always impressed by the many intelligent people from a wide diversity of backgrounds who appreciate what Arktos and our colleagues on the “alternative Right” such as Counter-Currents are doing. For me, meeting our audience on this occasion was even more exciting, as I would estimate that at least 90% of those in attendance were under the age of 40, which is in sharp contrast to similar events I have attended in the United States. This is not to criticize the efforts of our wise elders, but it was refreshing to see so many of those who will help to shape the future of Europe who were willing to sacrifice a beautiful summer Saturday in Stockholm to hear what we had to say. In conclusion, I can only say that my experiences here in Sweden have given me great cause for hope, but also a great deal of envy in regard to what we are lacking in America. The efforts of the European identitarians, by overcoming the baggage of the “old Right” and by offering fresh perspectives and a genuine identity rooted in traditional values to the youth of this continent, are beginning to bear fruit, and I believe they will shake European civilization to its foundations in the coming years. On the other side of the Atlantic, while there have been many promising developments in the United States in recent years, we have yet to see anything approaching a real alternative culture or community based on these principles arise, nor have we seen much street-level action. But I believe this has to be the way forward throughout the Western world. Publishing books, running Websites and holding conferences are indeed important, but if this doesn’t eventually lead to activity in the real world, we will remain nothing more than a cult on the margins of society. As a traditionalist, I naturally believe that riding the tiger of modernity is important, but I also don’t think it’s time to withdraw from the battlefield just yet. Let us draw inspiration from our European brothers and sisters who are still in the trenches, undergo an inner transformation in how we conduct and understand our lives, and set about the task of reordering the world around us.